While the New England Patriots -1 has been the consensus line across most sportsbooks both online and in Vegas, with most of the early money on the Patriots, one bookmaker still believes things will move in the opposite direction as the Sunday kickoff starts to approach. 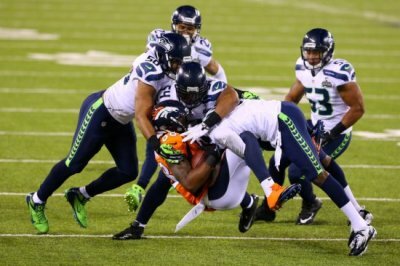 At online bookmakers such as Bovada and topbet, as much as 2.5 times more action has been taken on New England than on Seattle. Most of the public is still high on the Patriots but many odds makers believe the point will arrive when money starts showing up on the weekend for the Seahawks. The quiet before the storm is how is happens during the two week period between the conference championships and the Super Bowl. Once Friday arrives, things will change, according to online bookmakers betonline and sportsbook.com. One bookmaker said he has had just on bet of six-figures for the Super Bowl thus far and that was for New England. However, he said sharp money was favoring Seattle. So the thought is that the public was start to realize the same team that routed Denver in the Super Bowl last year is back again and their defense is still No. 1 in the league. 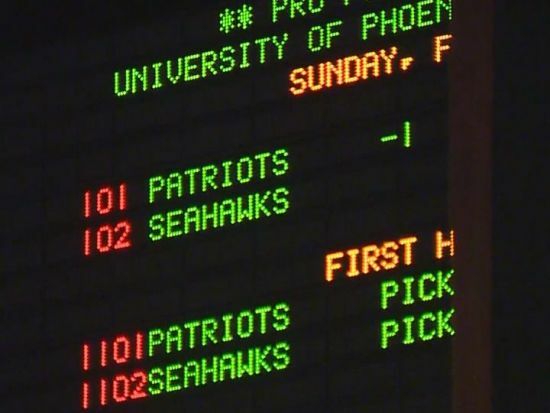 Some bookmakers moved the line from Patriots -1 to -1.5 and finally began taking money for Seattle, which prompted them to move it back down to Patriots -1. A large amount of sharp action at New England -1.5 caused the bookmaker to move the line back down. On the point total, the number is continuing to be bet down. Almost every bookmaker has the total sitting at 48, but a few here and there have it at 47.5. It is anticipated that public money will go OVER and that could prompt bookmakers to move it back up to 48 or even 48.5. Sharp money has taken the UNDER. The line opened as high as 49 and it has dropped to 48.5 and to 48, with a few at 47.5. However, books tend to stay on the high side since the public likes the OVER. However, the pros are definitely taking the UNDER. The Super Bowl parties will start Sunday across the country in bars and homes from coast to coast, as the single most popular sporting event in the U.S. prepares to kickoff. Bookmakers are expecting a surge in action from the public starting Friday and not letting up until just before the opening kickoff on Sunday at 6:30 p.m. ET from University of Phoenix Stadium in Glendale, Arizona.